One of the hallmarks of those who are living fully and experiencing happiness is that they are able to be present to opportunities to be grateful. Thanksgiving is such a great reminder to look at the many blessings we all have and to be thankful to God for them. I remember reading Victor Frankl’s book about his time in a concentration camp in the war and the impact it had on me. He talked about having very little to eat except broth. Some people were able to be grateful for the little they had and others were fearful and not able to be grateful and what a big difference this meant regarding their very survival over time. We know now that the brain reacts to gratitude in a positive way towards happiness and our biology follows suit. We know that our sense of spirituality is affected by our ability to notice and be grateful. As we are present and noticing we become more connected to Love. Your relationships with your partner and your family is one of the greatest blessings that you have. Take this day to remember past good memories together – they often get lost in the challenges of life. Bring them to mind and be thankful for them. Look at the characteristics that your partner has that you appreciate. There are many. Look at their values, their good intentions, their care for you and your family. Be grateful that they are willing to share their life with you. Express your gratitude out loud. 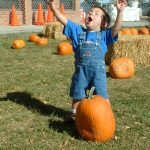 Notice that the child in this picture looks filled with joy in every part of him at his experience of a found pumpkin – we can learn from him. I hope you are able to find gratitude today amidst the wonderful traditions you may have (my turkey is beginning to smell great as I write this) as well as the challenges in your family that may bring sadness in your life. Our lives are not necessarily all easily felt blessings but sometimes take some work to find the blessings within the challenge. Sometimes families and health issues are a part of our lives that stretch us to find the places of gratitude but it is worth the effort to do so! My challenge to you today is to keep the gratitude expressions going for the next 2 weeks and see the difference that it makes for you and your relationship. Go forth and live fully! Wow, we actually have an international happiness day to help remind us of the importance of being involved with our own and our communities’ happiness. The General Assembly of the United Nations commissioned a Day of Happiness, to raise awareness that happiness, human flourishing and wellbeing are fundamental to all life. We know that flourishing people tend to be happier, healthier and smarter. They are more grateful, generous, creative, productive and open minded. As always, the small and simple things can have a great impact for someone today. Smile more today and say hello. Put some coins in a metered parking space for someone else. Give a hug (if I were with you I would give you a hug – I am sending you one virtually!). Listen for understanding. Share a kind word with your kids or your partner. Lend a helping hand – hold the door for someone. Think warm thoughts for those you see. Let your imagination go wild as to how you could impact others. Canada (where I am) ends up some where in the middle of the happiest people in the world. Many of our assumptions about what would make us happy are not true. For instance, wealth. After our basic needs are met, wealth is not a variable that makes us happy. Happiness is more an inside job, or an intrinsic characteristic such as gratitude rather then an outside variable, an extrinsic variable, such as wealth. Use this day as a great opportunity for discussion between you and your partner regarding what you are working for in your life to create happiness. The variables that make a difference world wide are also important to your partnership such as family and friend connections, having someone to count on, perceived freedom to make life choices and generosity are some of the variables world wide. Also take this day to reinforce your connections with each other and family and friends. When you do this, it makes a difference with your children and also your networks. Your gestures of goodness, kindness and happiness can spread like a contagion. In some innovative research Cacioppo, Christakis, and Fowler (December 2009) have shown that happiness, loneliness, altruism, and whether people cheat all spread through networks. If people cooperate, it is more likely that strangers, three degrees removed, will also cooperate. Like an event cone, one act, whether it adds happiness or unhappiness, changes and alters unrelated events. We need to celebrate and promote happiness to help with the brokenness in the world as well as ourselves. Happy Happiness Day! – Celebrate today well.